Most have heard of the expression, The Apple Don’t Fall Far From The Tree. In 2013, a certain artist moved that expression to an album title releasing a collaborative work with her dad, Peter Head. Fast-forward to 2017, she has released her sixth album while coming up with a most creative idea, mixing lyrical personifications with melodies. Sarcastically, this approach to music could catch on. 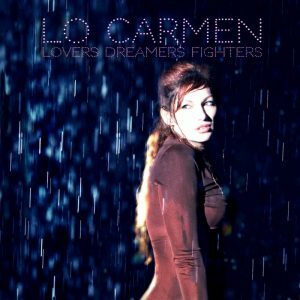 Her name is Lo Carmen, and her new release, Lovers Dreamers Fighters will keep you thinking. It’s just her, a guitar, and a bit of backup. By removing the flash with her unrestrained lyrics, Lo Carmen glows in the dark. Lo Carmen’s lyrics brings about many pictures. Lovers Dreamers Fighters is a collage of lyrical embodiments making the listener interpret their own daydreams. I have to believe dad is proud of her new release. But then again, The Apple Don’t Fall Far From the Tree. I’m J.R. Joseph Miller, and this is Lo Carmen singing to Lovers Dreamers Fighters.